Over 1.700 artists performing in 75 of Amsterdam's top clubs and venues makes the Amsterdam Dance Event the world's largest club festival. When there is a party in Amsterdam the whole of Amsterdam parties. The city seems to have a knack for big festivals that attract partygoers from near and far and the Amsterdam Dance Event (ADE for short) is no exception. From a small, experimental event first held in 1996 the Dance Event has evolved into the world’s biggest electronic music festival and most important professional platform for musicians and anyone else involved in the production of electronic and club music. Today this leading international club event is a magnet for the best DJs and performers who flock to Amsterdam from all over the world once a year to wow the crowds of fans and to attend professional events. Whether the Dance Event is the sole purpose of your visit or you, only plan to pop into any club for a party or two while in Amsterdam you will have no difficulty picking entertainment. It’s likely that you will be spoilt for choice. Hundreds of parties and performances are held across 75 of the most popular clubs, cafes, bars, rooftop terraces and open-air venues all over the city over the course of five nights. Fans of all genres and subgenres of electronic music can attend gigs given by their idols, as the world’s top DJs and artists perform at the ADE. The highlight of this fiesta and an event not to be missed is the DJ Magazine Top 100 DJs awards party held at the impressive Amsterdam Convention Factory. There is just as much going on during the day as there is at night time. Daytime activities and events are usually aimed at music professionals. For five days, venues across Amsterdam hold workshops, seminars, film screenings and other professional events geared towards the needs of performers and DJs. These events are part of the ADE Playground programme. A variety of events with a business and technology focus for the music industry and music producers are run under a programme called ADE Conference. The official dates are always mid-October. Tickets to parties and professional events are sold separately and should be purchased in advance. Whether you are a fan of electronic music or a professional adding these dates to your calendar is a must. The Dance event is a great opportunity to not only visit Amsterdam’s best nightlife hot spots and swing to the music produced by world-famous DJs but to explore this ancient city and feel its vibrant atmosphere. The easy-going and open-minded attitude of the Dutch and local businesses towards all things festive and wild make this event more pleasant and relaxed than many other similar festivals. Over 200,000 people attend this event over the five days so book your accommodation early. AmsterdamStay offers an unlimited choice of holiday rentals, hotels, B&Bs and hostels all over the city, we help you to find the right accommodation that will give you easy access to events held at different venues. Choose from hotels and rental apartments situated in beautifully-preserved and modernised period canal houses. You can enjoy modern amenities, beautiful views over the city’s iconic canals and have the freedom of exploring favorite landmarks. Click here to see all our apartments. Those who have not managed to book in advance can check our list of last-minute deals and discounts. Is Partying in Amsterdam Safe? Amsterdam’s the kind of place you can openly smoke weed and rest assured the Police won’t raise an eyebrow. You can even cruise over to the Red Light District where the oldest profession in the world is legal. These ladies of the night even have work permits, which begs a whole new meaning to “business time”. You can’t get any more legal than this! Whether people are passing through or simply getting ‘stuck’, Amsterdam gives people the freedom to do what is in other lands forbidden, in a somewhat safe environment. Safe? You question. And you have every right to. For it wasn’t that long ago that Amsterdam street dealers were passing off white heroin as cocaine, which saw some unfortunate fatalities and hospitalised tourists. This sort of thing might be normal in countries like Cambodia, where a little heroin muddled with your cocaine isn’t the worst that can happen to you. But in Amsterdam? It’s certainly a cause for nationwide panic. In a perfect world, cracking down on these street dealers would be a no brainer. But this world being far from perfect, Amsterdam adopts a ‘better safe than sorry’ approach. Without a moment’s thought, the city launched a drug awareness campaign, alerting tourists of the dangers of buying drugs from street dealers. They even made it easy for locals and tourists alike to get their illegal drugs tested, and not get into legal trouble. Drugs may be taken to a Jellinek clinic for testing, or simply pop into one of the smart shops around town to purchase a heroin self-tester kit. Many parents shudder when they think of what their kids get up to on a visit to Amsterdam. But contrary to popular belief, not everyone comes to Amsterdam for the drugs or ladies in the red-lit windows. The city draws in tourists in the thousands who come to meander canals, eat cheese, visit museums, and, of course, experience a string of yearly events. Nothing quite smells like Dutch spirit than an epic King’s Day or Gay Pride party. With the annual Amsterdam Dance Event held each October, it does raise the question: is Amsterdam’s drug scene safe? Thousands of young and older tourists flood Amsterdam during the second weekend of October to attend the infamous dance party. A string of top bill DJs will take to the stage at Amsterdam Arena, wowing fans from around the world who’ll be dancing, drinking, drugging, and partying. But will they be safe? 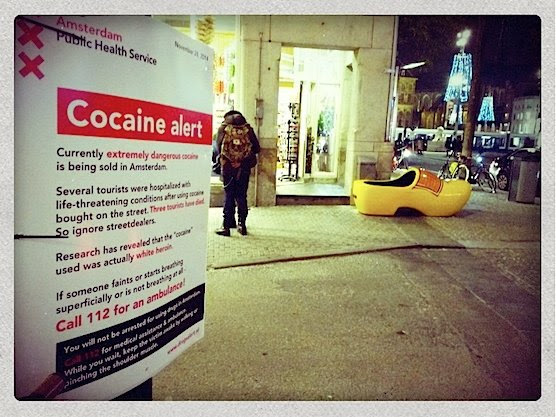 It’s been a few months since Amsterdam took down its drug awareness campaign. Perhaps it’s time to give everyone a friendly if not possibly a life-saving reminder to party responsibly. Let’s hope that the drug threat is at bay and that the fresh wind of partygoers is wise enough to know better and take care of themselves. Either by refraining from drugs entirely, or having them tested first. Because in a city like Amsterdam, you’d be stupid not to. Safe? You question. And you have every right to. For it wasn’t that long ago that Amsterdam street dealers were passing off white heroin as cocaine, which saw a number of unfortunate fatalities and hospitalised tourists. This sort of thing might be normal in countries like Cambodia, where a little heroin muddled with your cocaine isn’t the worst that can happen to you. But in Amsterdam? It’s certainly a cause for nationwide panic. Without a moment’s thought the city launched a drug awareness campaign, alerting tourists of the dangers of buying drugs from street dealers. They even made it easy for locals and tourists alike to get their illegal drugs tested, and not get into legal trouble. Drugs may be taken to a Jellinek clinic for testing, or simply pop into one of the smart shops around town to purchase a heroin self tester kit. Many parents shudder when they think of what their kids get up to on a visit to Amsterdam. But contrary to popular belief, not everyone comes to Amsterdam for the drugs or ladies in the red-lit windows. The city draws in tourists in the thousands who come to meander canals, eat cheese, visit museums, and of course experience a string of yearly events. Nothing quite smells like Dutch spirit than an epic King’s Day or Gay Pride party. But with the Amsterdam Dance Event looming around the corner, it does raise the question: is Amsterdam’s drug scene really safe? Thousands of young tourists will flood Amsterdam during the second weekend of October to attend the infamous dance party. A string of top bill DJs will take to the stage at Amsterdam Arena, wowing fans from around the world who’ll be dancing, drinking and partying. But will they be safe? It’s been a few months since Amsterdam took down its drug awareness campaign. Perhaps it’s time to give everyone a friendly if not possibly life saving reminder to party responsibly. Let’s hope that the drug threat is at bay and that the fresh wind of partygoers are wise enough to know better and take care of themselves. Either by refraining from drugs entirely, or having them tested first. Because in a city like Amsterdam, you’d be stupid not to.